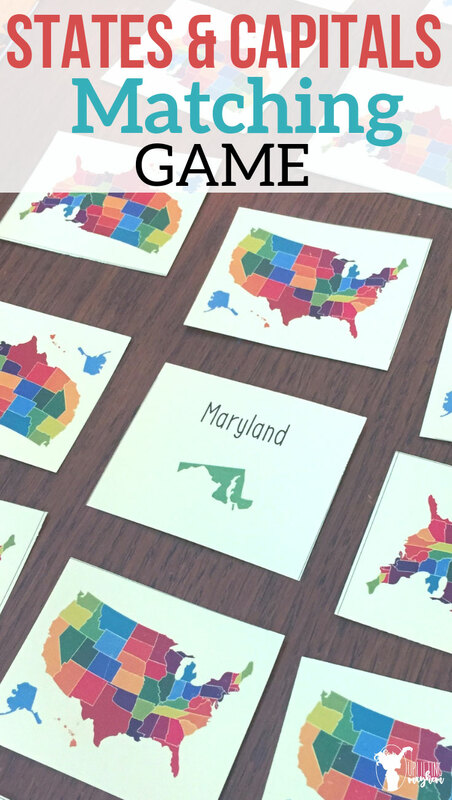 Is your kid struggling to learn the 50 states and capitals or do you just need a fun educational game for your kids to play? If yes to either of those, you have come to the right place! 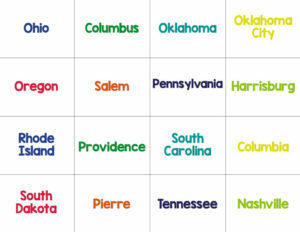 We have created for you a states and capitals matching game that has been a crowd pleaser in our household. If you get my weekly posts, you know that I’m a homeschooling mom going on my fourth year. It has been a rollercoaster of a journey! I have found what I like, methods of learning that I don’t like, along with how my kids learn and what makes them tick. I’m still learning everyday. One thing I have learned is that if your kid doesn’t want to learn, the concepts you teach him won’t stick. I am amazed in the power of a game, song and stories. Those three things have proven to be incredible assets in our homeschooling journey, and I might also add incredibly fun! Here is an example of how we have used games, music and stories to teach a concept. My son was learning the states and capitals by flash cards and a thing called ladders. It was shear memorization and absolutely boring for my 10 year old boy. We worked on them everyday (or so he told me :)), but it wouldn’t stick in his head. He probably learned a total of 10 states and capitals in 2 years. He wasn’t consistent at doing it everyday because he didn’t want to. This last year we have completely changed how we teach our children and have moved to stories, songs, poems and games. School doesn’t feel like school and the amount of knowledge they are retaining is greater than flash cards and worksheets. 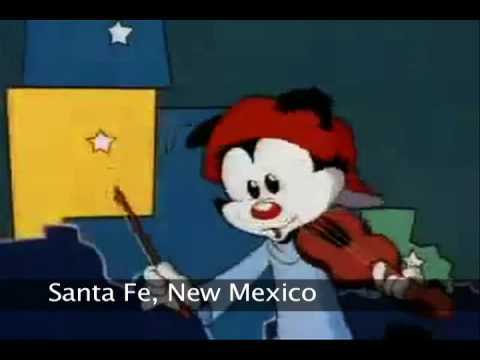 I found a song on YouTube called Wakko’s 50 States and their capitals. It is a silly song and when my boys first heard it they were skeptical they could learn it. However, after listening and singing to it everyday, my 4 oldest (11, 10, 8, 6) have all learned it and can sing it by themselves without music. The trick was singing it everyday! I began quizzing them throughout the day and found that if I asked them what the state of a certain capital was, (example: “What is the state of Boise?”) they could easily tell me Idaho. However, if I asked them what the capital of Idaho was, this was a little more difficult and would have to sing through the song to find the answer. I wanted to create a game to help them instill the states and capitals in their minds. 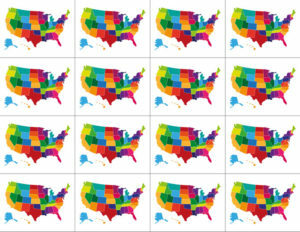 That is when we created this fun states and capitals matching game. It is just like any other traditional matching game, and is a fantastic resource for your kids of all ages. My 4 year old beat all of us when we played this game. There are two versions of this game. The first version is for younger kids who can’t read yet, and the matching cards include the shape of the states. The second version is for older kids who already know the states and capitals. These cards only have the names of the states and capitals on each card. 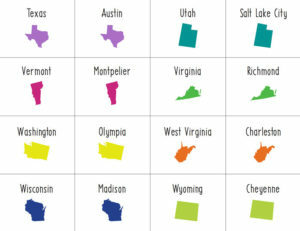 Step #1 – Download your own copy of the States and Capitals Matching Game. The way the states and capitals matching game PDF is set up should be fairly simple. Print out all of the younger version on one side (PG 1-6), and then place those pages back into the printer and print the back side (PG 7) onto the opposite side. Repeat for the older version. You can skip this step if you want to. I didn’t laminate mine in the beginning, but I found my boys played it often enough that cards were bent and dirtied up pretty fast. Simple, easy! I like to use the guillotine trimmers like this one. My four year old totally beat everyone revealing an amazing memory ability we didn’t know he had! Step #6 – HAVE FUN!! 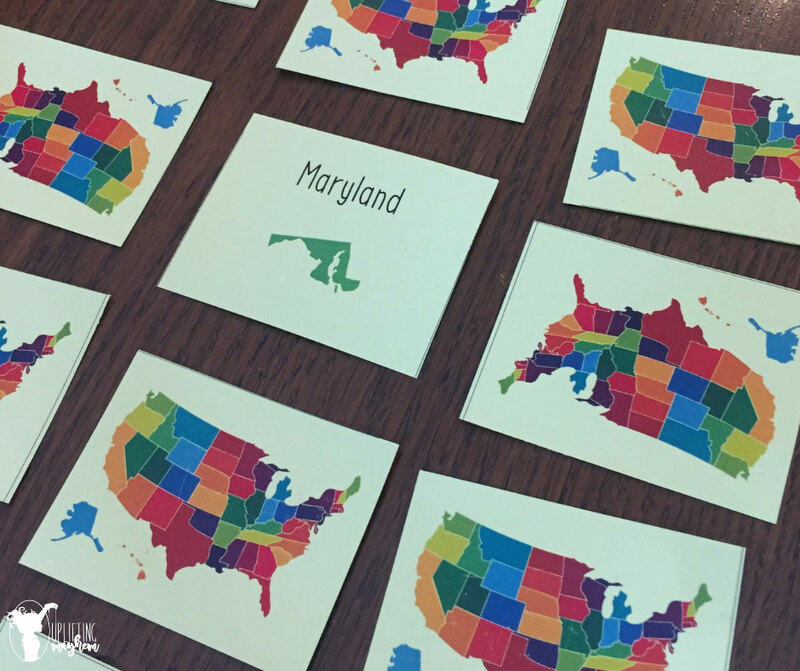 I hope you enjoy these states and capitals matching game printables like my boys have. I love what learning the song and playing these games have done. As we are reading stories and different states are brought up in the story, my 6 year old will yell out the state and it’s capital. It is amazing what songs, games and stories do to help educate your kids! Another plus is getting to hear them sing the song all the time too. This video shows them singing the song above, and then ends with their own freestyle version which is hilarious!